I saw this pretty clever use of Instagram advertising for the NetFlix orginal series Wet Hot American Summer. We like a lot of Paul Rudd's movies (most recently Ant-Man) so decided to check out the first episode. It was kind of bizarro how the role of teenagers was being played by full grown 40-something adult actors but it was pretty funny. When I went to google it to see who all was in it - it's packed with actors like Amy Poehler, Chris Pine, Bradley Cooper... what I turned up was Wet Hot American Summer the movie. I had no idea. 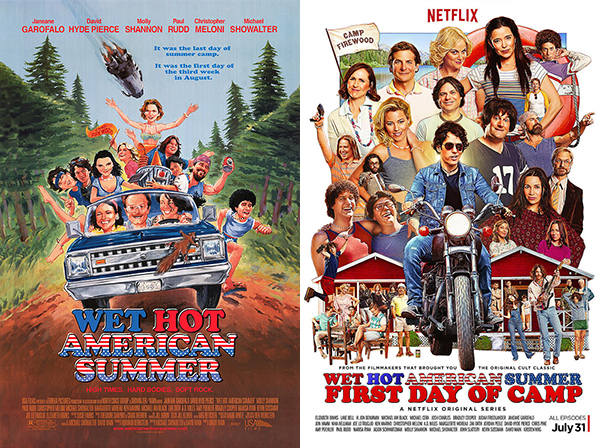 In 2002, Wet Hot American Summer was a released with a younger cast chronicling the last day of a camp in the summer of 1981. We decided to pause the Netflix series and go watch the movie first. Suddenly we were seeing Bradley Cooper in his first feature film... before American Sniper and Silver Linings Playbook. After watching that, we went back to the Wet Hot American Summer Netflix original series, Star Wars style - because the Netflix Series goes back to the same camp, same summer... but the first day of camp. (Get it? The first three Star Wars movies started at the end of the story?) Anyhoo... it got even stranger to now see the actors as the same characters, but aged 13 years. VERY interesting to see who aged better than others. Honestly Paul Rudd looked nearly the same. Both the movie and the series are goofy and funny and good entertainment during our own hot summer.